Beauty Blenders – Love ’em or Leave ’em? Beauty Blenders are all the rage these days, or at least that’s what it feels like. Head into Sephora and you can bet that one of the consultants is using one on a client. I was first introduced to a Beauty Blender in one of Jaclyn Hill’s videos. 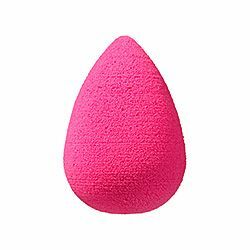 The Beauty Blender is an egg shaped sponge that is designed to give you a flawless finish when applying your foundation and concealer. The best way to use the beauty blender is to get it wet (it doubles in size) and then wring it out so it is just damp. In videos I have watched people dot the foundation on their face first and then use the beauty blender to blend it into the face. I don’t use my beauty blender for foundation so I can’t attest to how it works. I do however use the beauty blender for concealer. I just stipple the blender under my eyes and on blemishes and it pushes the concealer into my face. I will say when I use the beauty blender I notice that my concealer is less cakey. I think that is due to the fact that the blender is damp. I prefer to use the beauty blender for concealer rather than using a concealer brush. The Beauty Blender isn’t really a miracle product but it is fun to use.